Jagwar Ma's “Come Save Me” is as infectious as it is recognizable. The sweeping surf guitars and vocal cadences, each layer is another wave washing over you, the chorus cresting and crashing to throw some whitewater at you. 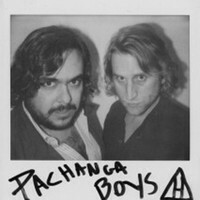 Pachanga Boys take us farther out to sea with their remix. The perspective is wide-angled, clocking a little over 12 minutes. The colossal layers stitch together hypnotically. House claps and deep kicks fading over an arpeggiated synth that sounds like Venice Beach. The perspective on this song is wide-angle. Clocking a little over 12 minutes, the loops layers take their time stitching together. The house claps and deep kicks fading over an arpeggiated synth that sounds like Venice Beach. The vocals fade in not long after the steady tambourine, and you can feel the water beneath you. The lyric “Come and save me” draws you farther out to the horizon. This is a siren’s song.